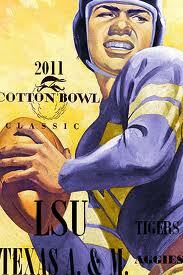 The Cotton Bowl this year is one of the few none BCS games to feature two ranked teams in #11 LSU vs. #17 Texas A&M. The Aggies are coming off one of their best seasons in recent memory, while the Tigers had a relatively good season but with more close games than they probably care to remember. This is a meeting between two very good defensive squads and like most LSU games in recent memory will probably be fairly low scoring. The Aggies made a QB switch half way through the season when they switched from Jerrod Johnson to sophomore Ryan Tannehill. Tannehill was formerly their starting WR but had been recruited to play QB and was essentially being groomed to take over the job next season. Since he has taken over as the starter they have been undefeated so it seems like it was a pretty good move. Their running back Cyrus Gray has rushed for over a 1,000 yards and has 12 TDs on the year. He has rushed for over 100 yards in every game since they made the QB switch too. The A&M offense will have a very tough task tonight as they face what has become perennially one of the best defenses in the country. The Tigers D is led by stars Drake Nevis and Patrick Peterson. The Defensive Tackle and Cornerback, respectively, could be chosen in the first round in this year's NFL draft. Peterson is being talked about as though he could be one of the best CB prospects to come out in the last decade. Aggie Star WR, Jeff Fuller will likely be seeing a lot of Peterson tonight and if he has a good game you can expect to see his draft stock rise quite a bit. As you can see, this won't be an easy game even for the on fire Aggie offense. Things won't be much different when the Tigers have the ball though. They offense hasn't been so hot this season behind their constant dual "non" QB controversy system with Jarret Lee and Jordan Jefferson. Their big threat on offense is RB Stevan Ridley who has also rushed for over 1,000 yards and has scored 14 TDs this season. WR Terrence Toliver was expected to have a breakout season this year but fell well short of his numbers from last year with only 36 catches and two TDs on the year. The 6'5" Senior will be looking to have a big night in order to show scouts that he has what it takes to play in the NFL. The star on Texas A&M's defense is without a doubt LB Von Miller. Miller plays sort of a hybrid DE and OLB position and is a phenomenal pass rusher. Look for him to be all over whatever QB is taking the snap for LSU tonight. He is another one of the very talented players in tonight's game with a shot at the first round of the NFL draft come April. Due to all the talent on defense in tonight's game, I think it's going to be pretty low scoring. But this is college football and that means crazy things are bound to happen. Just because it might not be a shootout kind of game doesn't mean it's not going to be a lot of fun to watch, especially with Les Miles at the helm.